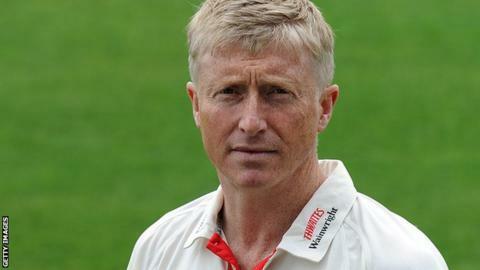 Glen Chapple is stepping down from the Lancashire captaincy, but will remain at the club in a player-coach role. The 40-year-old will be part of new director of cricket and head coach Ashley Giles' backroom staff. Chapple took charge last season after Peter Moores became England head coach, combining his captaincy duties with coaching, but the Red Rose county were relegated to Division Two. He was skipper at Old Trafford since 2009 and led them to the title in 2011. "This summer was a steep learning curve, I had to deal with a lot, but I really enjoyed it if I'm honest," said Chapple. "I'm just looking forward to getting into coaching properly now, because when you're captain and playing, there were things that came along that I just couldn't do. "As a team we struggled and the job became a tough one to do." The all-rounder has just completed a 24th season with the county, having made his debut in 1992, and has taken 975 first-class wickets at an average of 26.48. He has also scored 8,674 first-class runs, including six centuries. Prior to being appointed to his new role, Chapple said he was unsure of his future at the club, but did express an interest in becoming head coach.